Granular activated carbon (GAC) is a support material that is very favourable to the development of some bacteria that are widely found in the environment such as nitrifying bacteria or heterotrophic bacteria responsible for metabolising biodegradable organic matter. organic molecules used as bacteria nutrient and trapped in the GAC pores. Therefore, when the bacteria first attach to the GAC, this takes place very rapidly; subsequently, a balanced bacteria population is achieved and needs to be controlled through sufficiently frequent washes (i.e. at approximately weekly intervals); these washes are also necessary to ensure that a population of micro-invertebrates, feeding off these bacteria, does not colonise the GAC. an additional TOC reduction by biological means, leading to a plateau that is noticeably lower than the previous one; this effect appears to be independent of the type of GAC even when the latter has been specifically designed as a substrate for a biological activity; it concerns BDOC removal. The kinetics of biochemical reactions are closely linked to water temperature: For instance, for the same TOC abatement, we need almost double the contact time when the temperature drops from 20°C to 8°C even when the attached bacterial biomass is, on average, identical at the two temperatures. 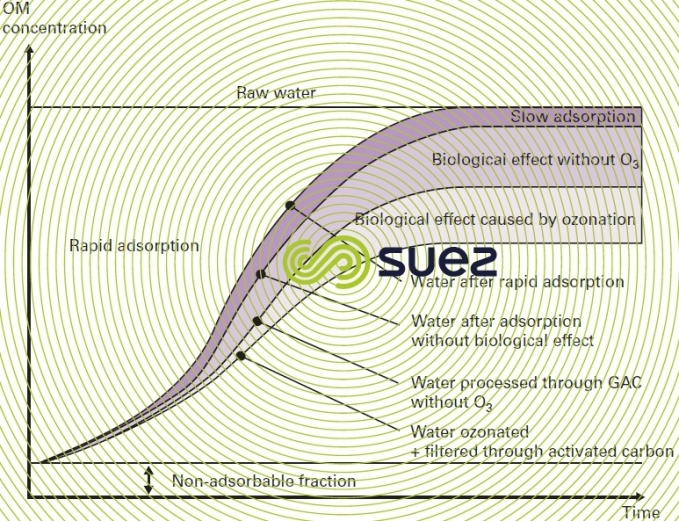 additionally, ozone, by "fracturing" many complex molecules (see the oxidants and disinfectants), renders these biodegradable; thus the biological elimination of organic matter increases more than if no ozonation had been applied (figure 44) and it can be assumed that the GAC filter has, in fact, become a biological activated carbon (BAC) filter by virtue of this design and operating method. and most mineral micro (heavy metals) and organic (pesticides, phenols, hydro­carbons, detergents, algal toxins…) pollution. That is why many modern water treatment plants include this type of polishing downstream from clarification (see polishing: removal of organic matter and micro-pollutants).